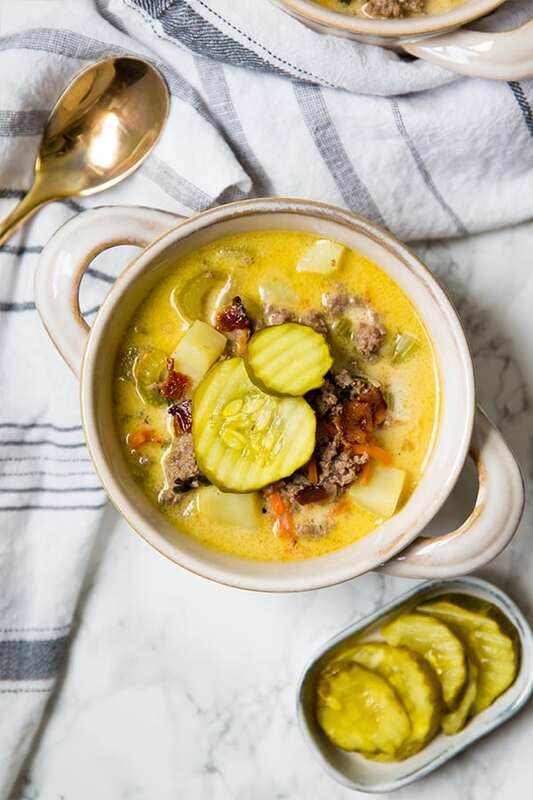 This bacon cheeseburger soup is dairy free, but has all of the flavors of a bacon cheeseburger! It’s Whole30, paleo, and AIP. There are few things that are as comforting and delicious as a cheeseburger! Right? You just can’t get much better than a juicy burger, savory cheese, and I mean, more power to ya if you’re gonna add bacon on there. The only way to make this situation more comforting is if you turn it into a soup! But can you do bacon cheeseburger soup without the cheese? Yes! This bacon cheeseburger soup seemed like the kind of thing that just wouldn’t be quite the same without the cheese. I mean, cheeseburger with no cheese? Sounds pretty counterintuitive. But when the craving strikes and you’re dairy free, I promise you that the flavors are there and that this soup is still just as tasty! I was skeptical as to whether or not my cheese loving husband would be into this soup. He tends to stand pretty firm that anything that should maybe have cheese, just needs to be covered in cheese. However, he loved the soup just as much as I did! Winner! 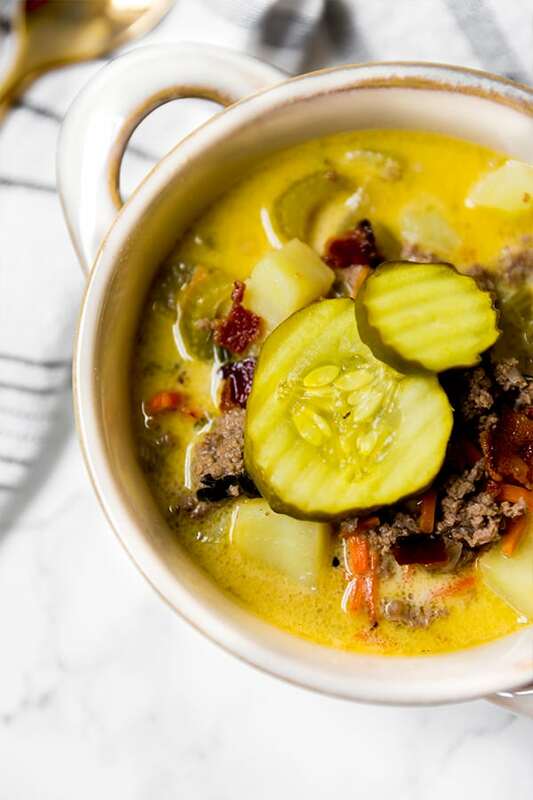 This soup really addresses the craving for those bacon cheeseburger flavors, and it’s super filling. 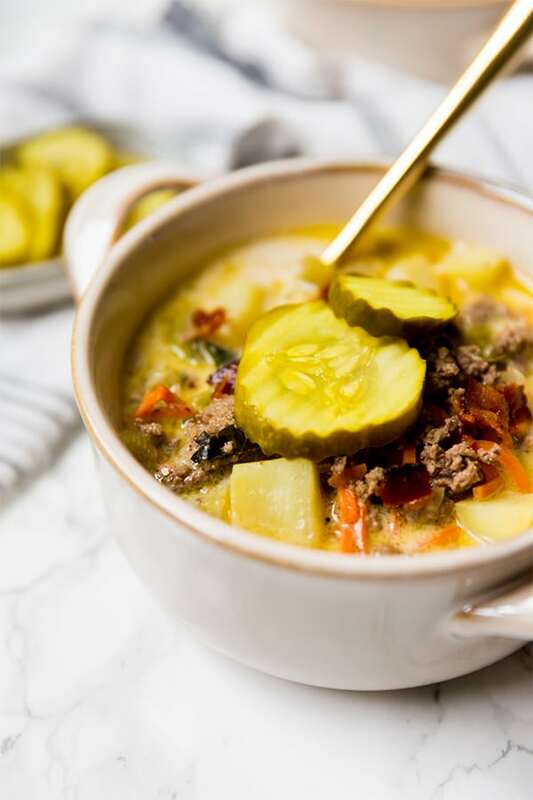 It features healthy fats, proteins, starchy carbs, and several different kinds of veggies all in one soup while staying disguised as a fast food favorite. My kind of meal! What makes the chicken broth a better choice for this soup than beef, is that its color and flavor is milder which allows the other ingredients to shine. The coconut milk is mixed in to make for a creamy base. I recommend using a higher fat beef for flavor, and whichever bacon is your favorite. If you’re not AIP, you can use regular potatoes but I use white sweet potato to keep it nightshade free and AIP. These are the veggies needed for the soup. This is what creates that cheesy flavor. The soup won’t have the cheese taste without this. 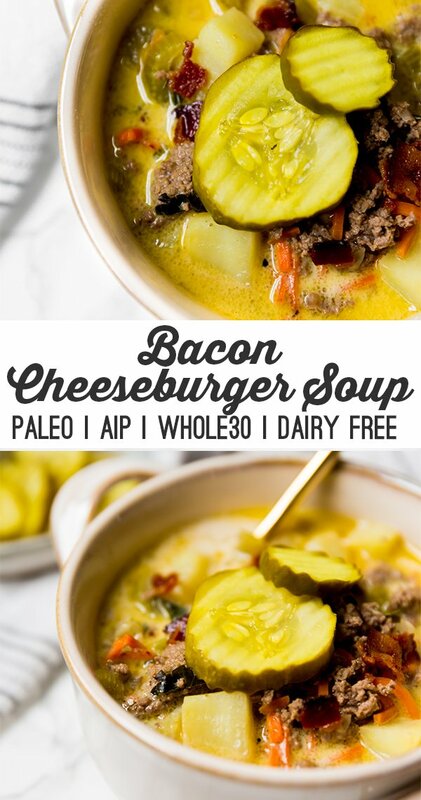 This bacon cheeseburger soup has all of the flavors of a real bacon cheeseburger while being dairy-free, paleo, whole30, and AIP! Using a large soup pot, cook the ground beef on medium heat and lightly salt. Cook until browned and set aside, draining excess fat. Add avocado oil to the same pot along with the diced onion and garlic and saute on medium heat until translucent. Add in the carrots, celery, sweet potato, parsley and saute for 5 more minutes or until slightly softened. Pour in the chicken broth, coconut milk, salt, garlic, nutritional yeast, beef and stir to combine. Bring to a low simmer for 15-20 minutes or until the vegetables are tender. Remove from heat and spoon into bowls for serving. Top with cooked bacon, parsley and pickles if desired. Pickles in soup was the best surprise of my 20s! I totally forgot about it, I need to make this ASAP! Thank you friend!! I’m obsessed with all of the fermented and pickled things! This was so delicious! Made it on a cold, rainy day. I didn’t have the yeast, but still tasted yummy. For how yummy this came out, it’s hard to believe it was healthy! Do you think this could be done on low in a crockpot? This was amazing! Subbed mushrooms for the celery and added an arrowroot slurry at the end to thicken it. Yummy! Of course, this was delicious and hit the spot on this crip and chilly fall day. This looks delicious! Did you use canned coconut milk or the kind from a carton? Canned coconut milk that doesn’t have thickeners 🙂 Thank you! WOW!! This soup is amazing!!! Absolutely loved it! Great recipe! Even my kids liked it! So good and the perfect comfort soup!